Please let me know who my fellow Wholockians are so that we can have a massive squee-party together, mmkay? I have seen every episode of Sherlock. I'm very frustrated that it'll be at least a year before new episodes. I have seen up to 7.2 of Doctor Who. I did not watch seasons 1 or 2 of Doctor Who. I don't love Rose and I wanted David Tennant and Matt Smith. I have come to the conclusion that Matt Smith is my favorite doctor, but it took me a while to get there. And... I think I've hit all the important parts. Now TALK TO ME! What thinkest thou? Let's start talking! Yay! A new Doctor Who fan! River is one of the BEST characters on TV. Matt Smith, is definitely my favorite Doctor. Although I did love David Tennant as the Doctor, too. You should definitely watch the season(s) featuring the ninth Doctor because by the end you'll most likely like him. Since you recommended it, I am going to watch the first episode of Sherlock since I happen to have it. SQUEE!!! I love it. Not as much as Doctor Who, but pretty close. Now I'm going to have to find a way to watch the rest of the episodes that are available. They're superficial reasons why I don't like her: I don't like her voice, her teeth, or her attitude in season 4. And so I started with Season 3 just because I wanted to catch up to my friends (who were starting season 6). I do intend to watch the first two seasons. Probably this summer. Lovely to have you on board. Both are worth the time. David Tennant is still my favorite Dr., but I agree about River Song, she is a great character. I still can't decide about my favorite companion. I do love Amy Pond, maybe it's her accent and red hair. Hahaha! There have been some fabulous companion's. About Sherlock. Has anyone seen A Room With a View? 1985 movie with Helen Bonham-Carter, (no, I cannot truly recommend it because it has men bathing in a pond) but, the man playing the police detective on Sherlock is Freddy from that movie. I just about died. Freddy was adorable. So funny. Okay, which DR Who is the one to watch? Netflix has a few. I haven't watched Sherlock but will plan on it. Well, there's really only one Doctor Who. It's complicated. I would suggest either starting with season 1 of the reboot (with Christopher Eccleson and Billie Piper) or you can do what I did and start with season 3 or season 4. Do NOT start any later than season 4, though. If you search Dr Who on Netflix, the first one to pop up should be the one you're looking for. I'd recommend starting with Season 1. The first few episodes take a little getting used to, but it pays off later on if you've seen Seasons 1 and 2. Also, I highly, highly recommend Sherlock! I should hang with you. I love all those shows. yes a River fan too. It has taken me a while to like like Matt Smith. I am an tennant girl. I thought I was a Tennant girl, too, but then Smithy won me over. :D And yes, we should hang out. Haven't seen Dr. Who (someday) but I have seen Sherlock. I love Sherlock so very much. I want whoever designs the sets to come and design my house for me--all that wallpaper is just amazing. But I love watching that show so much--it's so fast-paced and wonderful. I know! When my friend told me each episode was 90 minutes I was a little... put off. But they totally don't feel so long! I'm on the edge of my seat THE WHOLE TIME. And I agree, all the sets, costume, everything!, is wonderful. Like Heather, I haven't watched Dr. Who but I love Sherlock! I would like to get subtitles to it cause he just talks so fast + the British accent + the low volume. It's hard to keep up at times, but I love it! Sherlock is absolutely BRILLIANT. I love everything about that show and I am DYING for the next season! I'm a Donna fan. Love her sass and her boldness and her insecurity mixed with intelligence and the way she doesn't ever let the Doctor have his way just because he's a Time Lord. "Journey's End" breaks my heart each and every time I watch it. I'm starting to really like Martha, too, but I prefer her in series 4 and Torchwood, after she's finally accepted that she is good. And I *think* that I might like Clara a lot; she reminds me a bit of Donna. Not a River fan, but I'm planning on emailing you my thoughts this weekend because it's quite a short essay, you know? Don't ask me to pick my favourite Doctor; I can't. Fine, it's David Tennant. I like Matt Smith's portrayal, but I'm just not a huge fan of Moffat's showrunning, and it really affects my general view of series 5-present. And I do like Christopher Eccelson as the Doctor; I think that knowing the Ninth Doctor is important to understanding the Tenth Doctor, just as you need to know the Tenth Doctor to really understand the Eleventh Doctor. Basically, I'm living for 30 March. Series 7 Part 2. I love Donna, too! I haven't watched Torchwood or anything like that. Good? Yay! A new Wholockian! 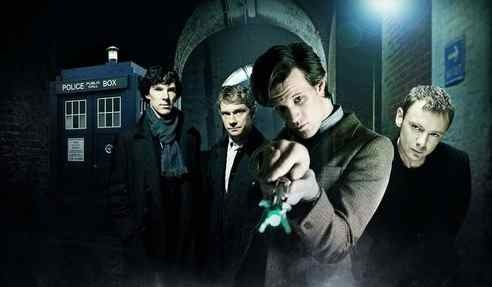 I LOVE both Sherlock and Doctor Who. I've seen Doctor Who (seasons 1-7) twice, Sherlock (seasons 1-2) at least 5 times (probably more). Tennant is my favorite doctor but I highly prefer Moffat's writing to Russell T. Davies'. The more I see of Matt Smith, the more I like his doctor. I can't decide on a favorite companion - I really do love them all. Eccleston's (Nine's) episodes are a little strange and the cheesy CGI is a little off-putting, but he definitely grows on you. The season one episodes "The Empty Child" and "The Doctor Dances" are among my favorites of all 7 seasons. As for Sherlock... don't even ask. I can quote entire scenes from memory. I recommend it to everyone I know. It's my absolute favorite show, and I am so, so excited for season three!!! Apparently I'm the opposite of most commenters here- I've seen every episode of Sherlock but none of Dr. Who. I should fix that. Squee! Always excited to find other Dr. Who fans! I absolutely adore River Song, and the Ponds were awesome! Haven't watched Sherlock, but guess I need to remedy that if you guys like it so much. Can't wait to watch the new season and find out the story behind his newest companion! I've watched enough of Doctor Who to be an admirer, but I haven't seen every episode. I like River Song, too. Amy might be my favorite tag-along girl. Sherlock is pretty awesome too, and if you liked this series then you will probably like Elementary on CBS. Basically the same idea, modern day Sherlock Holmes, only Watson is a woman and he lives and works in NYC (although he is British). Aw, yay, welcome to the fun side of life! I like pretty much all the companions in their own time. Martha was the most meh, and Amy ticks me off because the current writers acted like she was the be-all-to-end-all and I'm like HELLOOOOO. Rose and Donna and Martha! Remember them?! The Doctor wanted to MARRY Rose, for goodness sake. I'm not sure how I feel about the new girl, though. I've never seen Sherlock, but I've seen bits and pieces of Dr. Who. I LOVE British television. I find it really entertaining and often a lot more intelligent than American TV. I loved BBC's Merlin (it ended it's 5 season run recently), and I also watch Game of Thrones. The British are certainly doing something right!